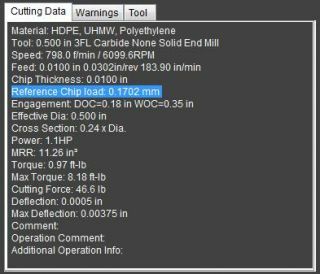 I am running V1.536 and when I look at Reference Chip Load the dimension is in mm while the rest of the parameters are in inches. I tried clicking on the units for change, but that only works for other parameters. Having the Ref Chip Load in inches here would be a help. Is there a setup that I am missing to get this to report in inches? Units in the Cutting Data tab are controlled by the units in the corresponding input field. To switch it back to inches, click on the "in" label in the Manufacturer Speeds and Feeds panel. See screenshot. Or click on the Input Units on the bottom of the window a couple of times until all units switch to what you need. 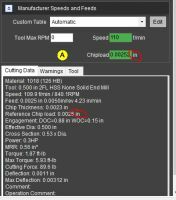 On clicking the "Chip Load" dimension, it would change the dimensions of Feed but not ReferenceChipLoad. However, toggling the Input at the bottom of the HSM window got the change made. Thanks for a good, useful product!